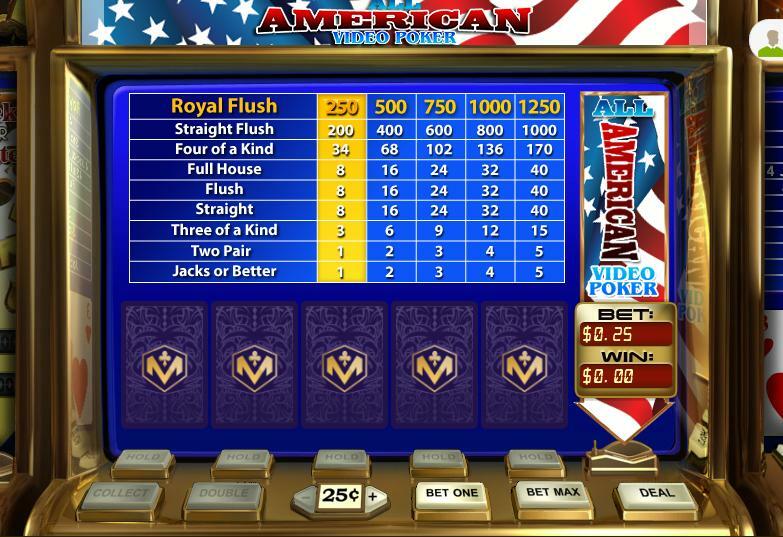 Playing the All American video poker game is very easy to do for all that you first need to do is to pick a coin value and then decide if you want to play one to five coins on each hand, once you have made your wagering decision then just click onto the play button. Five playing cards will then be dealt out to you and you must decide which if any cards to hold and which ones to discard by clicking on the play button once more any cards you do not hold are replaced with new ones and you simply have to form one of the winning combinations on the pay table to receive a winning payout! The payout percentage of the All American Poker game has been certified and this WGS game has also been independently tested and verified as being a completely random game too so you will always get a random and fair outcome when playing it. There are lots of winning hands that you can be dealt out when playing the All American Poker game and the pay table will show you all of the hand combinations that do pay an award, there are lots of unique ones on offer on this game including the Full House hand which pays 40 coins when you are playing maximum coin hands. The All American Poker video poker game only has an optional bonus game that being the All American Poker double or nothing game which is an optional feature you will be allowed to make use of if you have been dealt out any winning hand combination when playing this game. That gamble game will see the All American Poker game, when you have clicked onto the gamble button, present you with a playing card face up and four facing down playing cards and you will then have to select which of the four facing down cards is higher than that of the face up cards. When taking the All American Poker game gamble game if you make an incorrect decision you will lose what you have won, however make a correct decision and you base hand winnings will be doubled. The All American Poker game will also let you take the gamble game again after a correct decision until you have reached the gamble game limit. You will find when playing the All American Poker game you can play for different coin values and can also play up to 5 coins per hand, so it can be a low stake or high stake video poker game. You need to get to grips with playing and video poker game perfectly and optimally before playing them for real money for it is often the case the decisions you make once your initial hand has been dealt out to you in regards to just which cards you hold and discard that will ultimately determine your winning chances. There is a very simple way that you can always play any type and category of video poker machines optimally and with the very best strategy in place and that is by you using the auto hold option setting as that will hold the best cards of you when you have been dealt out to your base hand! If you want to play the All American Poker video poker game for real money then you will need to find a casino banking option that is suitable to you, Western Union is one such method that quite a number of casinos will accept and it is worth knowing you can claim plenty of bonuses at many online casino sites when you do deposit using Western Union.